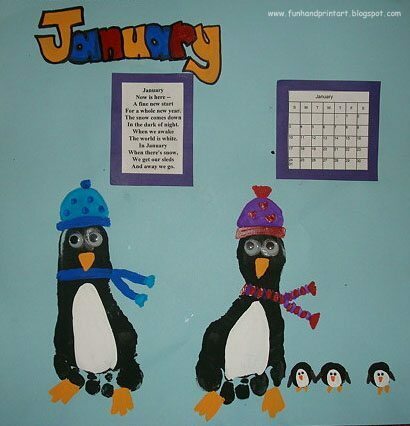 Aren’t these footprint penguins adorable? Place a black footprint on a piece of paper (I used card stock). When it dries, paint on a hat and a scarf (optional) and orange penguin feet and a beak. I glued on googly eyes but you may also choose to paint the eyes. Place as many black thumbprints as you wish. When they dry, paint on the white tummy and then add the eyes, beak, feet, and wings. I printed a tiny calendar for free from the Print Free Website. For a whole new year. In the dark of night. Have you seen the Keepsake Handprint Calendar I made? I decided to start one for this year too since it’s so cute to see my son’s growth documented in such a unique way. Very cute! I may try those with my 3 year old class next week. Yes, they are adorable! Especially the babies! love your ideas for the calander especially the lobster Will have a go with my playschool children in Ireland. Thanks for sharing. Hey, just wanted to let you know that I enjoy your blog and I’ve featured you on mine. Feel free to stop over, say hello and grab a featured button. Thanks for sharing such awesome ideas! Have a great day.